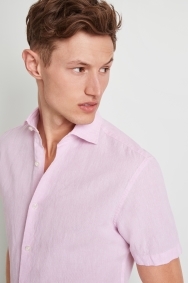 Turn to this pink shirt from Moss 1851 and you’ll be more than ready for any smart casual occasion. Ideal for relaxed weekend events or for when you’re jetting off to sunnier climes, its warm tone delivers subtle charm while its rich linen blend brings comfort into the mix. Cut in a slim fit to ensure your appearance will always be sharp and machine-washable, it will quickly become a go-to item. Contrast the pink tones of the shirt with chinos or shorts in neutral colours – opt for navy, dark grey or tan.